One of the most popular zoom lenses available, a standard zoom lens offers a wide-angle through to short telephoto focal range in a single lens. Combined with a “fast” f/2.8 maximum aperture, the standard zoom is one of the most versatile lenses for photographers shooting events, press stories, wedding or portraits. We’ve tested seven standard zoom lenses on the EOS 5DS R, with scores ranging from a high of 36 points for the Sigma 24-35mm f2 DG HSM A to a low of 25 points for the Canon EF 24-70mm f/4L IS USM. Despite the Sigma 24-35mm posting the top score, we’ve crowned the Canon EF 24-70mm f/2.8L II USM the standard zoom lens winner, as it offers a more versatile and typical standard zoom focal range of 24-70mm on a full-frame sensor. If it’s the best optical performance at wider focal lengths you’re after, the Sigma 24-35mm f2 DG HSM A just squeaks by the Canon EF 24-70mm f/2.8L II USM to the top spot with an overall score of 36 points compared to 35 points for the Canon. Both of these top two standard zooms boast a sharpness of 32 points, but the Sigma 24-35mm offers slightly improved performance for the lens metrics of transmission and chromatic aberration, as well as boasting a faster f/2 maximum aperture. One of Canon’s most recent additions to its professional lens line up, the EF 24-70mm f/2.8L II USM comes with a fairly hefty $1899 price tag. But as the saying goes, you get what you pay for, with great sharpness and solid results across the board. If your budget doesn’t stretch that far, however, the Tamron SP 24-70mm f/2.8 Di VC USD is a slightly more palatable $1299 and charts in at thrid place for standard zoom lenses on the EOS 5DS R. The Tamron boasts some excellent scores, too, with the best standard zoom results for distortion, vignetting and chromatic aberration on the 5DS R. Its sharpness score of 24 points is well down compared to 32 points for our winner, the Canon EF 24-70mm f/2.8L II USM, however, which will be a deal-breaker for many photographers who are prepared to pay more for better resolution. At the maximum aperture of f/2.8, the Canon EF 24-70mm f/2.8L II USM delivers excellent edge-to-edge sharpness at all focal lengths and significantly better performance at f/2.8 compared to its predecessor, the Mark I version. 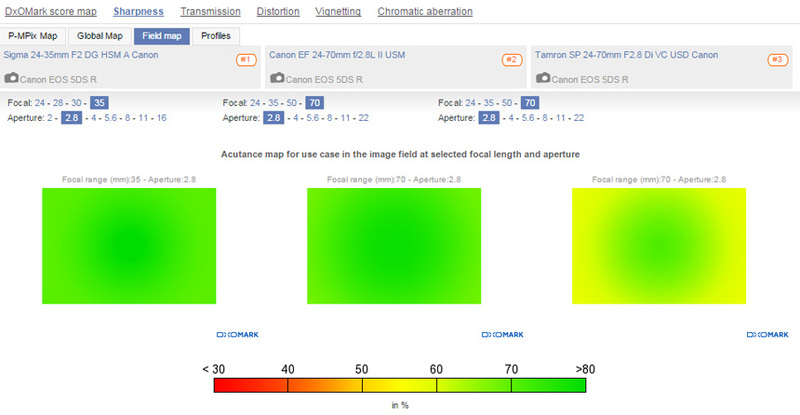 In comparison, while good at 24mm f/2.8, as you zoom in on the Tamron SP 24-70mm f/2.8 Di VC USD, edge sharpness drops off between 35mm and 70mm, which has affected the Tamron’s overall sharpness score. A popular focal length for weddings, environmental portraiture and reportage, we’ve tested seven 35mm prime lenses on the Canon EOS 5DS R. Overall scores range from a high of 42 points for the $1800 Canon EF 35mm f/1.4L II USM to a low of 30 points for the discontinued Canon EF 35mm f/2. Performance among the top three lenses in this category is pretty close, with the cheaper $899 Sigma 35mm f/1.4 A and $549 EF 35mm f/2 IS USM putting in very respectable scores compared to the more expensive Canon option. But for distortion, chromatic aberration, and (crucially) sharpness, the Canon EF 35mm f/1.4L II USM is just that bit better than the competition. In fact, with an overall sharpness score of 37 points, the Canon EF 35mm f/1.4L II USM is the sixth-sharpest lens available for the EOS 5DS R and offers excellent edge-to-edge resolution at aperture settings between f/1.4 to f/11. If you’re after the best sharpness at the maximum aperture, the Canon EF 35mm f/1.4L II USM is far ahead of the competition, with similar levels of sharpness achieved for the Sigma 35mm f/1.4 or the Canon 35mm f/2 when the aperture is stopped down to f/2.8. A 50mm standard focal length prime is usually one of the best optics for a full-frame sensor, offering a fantastic price-to-performance ratio, together with a versatile focal length for many subjects. We’ve tested seven 50mm prime lenses on the Canon EOS 5DS R, with scores ranging from a high of 44 points for the $949 Sigma 50mm f/1.4 DG HSM A to a low of 33 points for the $349 Canon EF 50mm f/1.4 USM. With a top-of-class sharpness score of 40 points, the Sigma 50mm f/1.4 is the fourth-sharpest lens available for the EOS 5DS R and the only optic in the “Top 5 Sharpest” with a less-than $1000 price tag. In fact, with the best lens metrics for distortion, vignetting, and transmission, as well as a very respectable score for chromatic aberration, the Sigma 50mm f/1.4 is really a “must have” lens for the Canon EOS 5DS R. Its sharpness score of 40 is miles ahead of the other 50mm competition — a staggering 15 points ahead of the more expensive Carl Zeiss Makro-Planar T 50mm f/2 ZE, and over twice the resolution of the Sigma 50mm f/1.4 EX DG HSM. At its maximum f/1.4 aperture setting, the Sigma 50mm f/1.4 DG HSM A offers excellent center sharpness, and although this doesn’t extend right into the corners, its edge resolution at f/1.4 is notably better than the other top three options. What’s more, the Sigma 50mm A offers homogenous sharpness at all other aperture settings between f/1.8 to f/16, with razor-sharp performance between f/2.8 – f/8. The short telephoto 85mm focal length is a popular choice for portraiture and is well-suited for studio photography on the 5DS R. We’ve tested seven 85mm primes on the 5DS R, with scores ranging from a high of 47 points for the Carl Zeiss Apo Planar T* Otus 85mm f/1.4 ZE to a low of 33 points for the Carl Zeiss Planar T 85mm f/1.4 ZE. The top three 85mm primes on the 5DS R come from three different manufacturers, including the own-brand Canon EF 85mm f/1.2L USM in third place with 38 points, Sigma’s 85mm f/1.4 EX DG HSM in second place with 43 points, and the Carl Zeiss Apo Planar T* Otus 85mm f/1.4 ZE on top with 47 points. With a massive $4490 price tag, the Carl Zeiss Apo Planar T* Otus 85mm f/1.4 ZE is one of the most expensive lenses available for the Canon EOS 5DS R, but you get a lot of optical performance and outstanding resolution for your cash. With a sharpness score of 41, the Zeiss Otus 85mm is the joint second-best sharpest lens available for the 5DS R, alongside the Carl Zeiss Apo Sonnar T* 2/135 ZE, and is only bettered by Canon’s own 300mm telephoto prime lens. 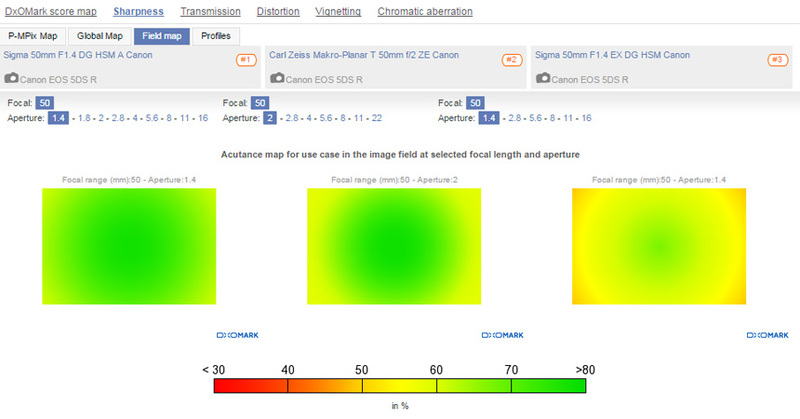 Other lens metrics for the Zeiss Otus 85mm are much closer compared to the second-place Sigma 85mm f/1.4 EX DG HSM or Canon 85mm f/1.2L USM, so it really is the outstanding resolution you’re paying for, with edge-to-edge sharpness at all aperture settings. 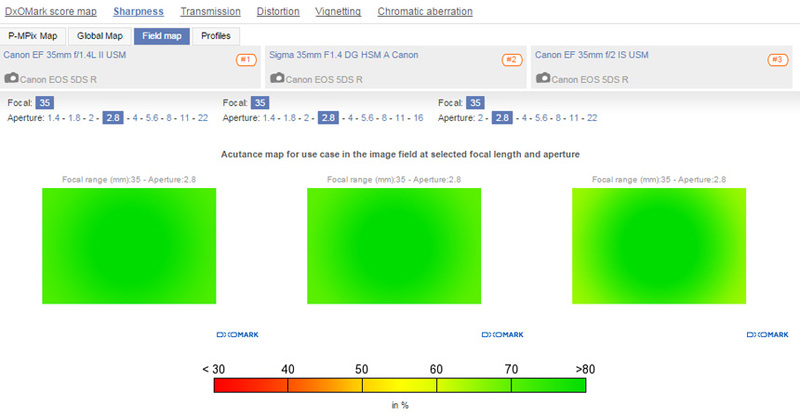 In comparison, both the Sigma and Canon 85mm options suffer noticeable edge softness at the maximum aperture setting of f/1.4 or f/1.2, respectively, with both lenses needing to be stopped down to f/2.8 before they offer something approaching homogenous resolution right to the corners. 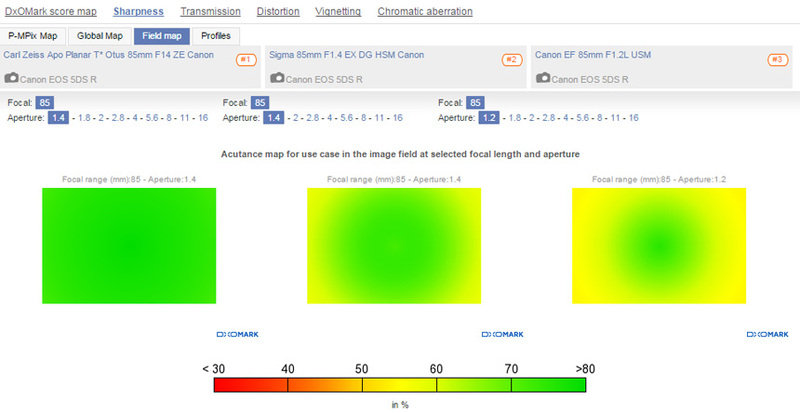 Canon EOS 5DS R Sensor Overview: How does the EOS 5DS R compare? 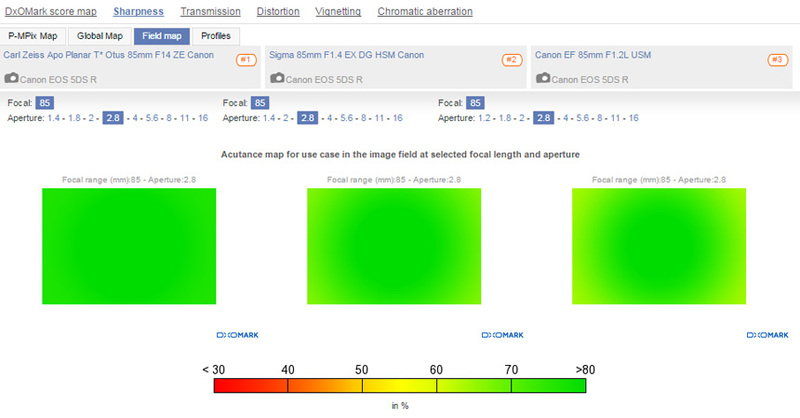 Offering the highes-resolution sensor currently available in a Digital SLR camera, the 50.6Mp Canon EOS 5DS and 5DS R are the highest-scoring Canon sensors in our database. 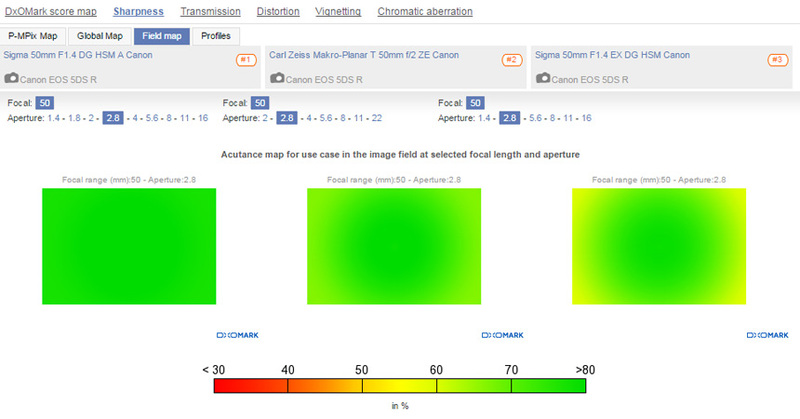 With overall DxOMark sensor scores of 87 points for the 5DS and 86 points for the 5DS R, there’s clear daylight between these models and the chasing Canon 1Dx and 6D sensors, both with 82 points overall, and the EOS 5D MK III with 81 points. With a cheaper price point and more manageable file sizes, the EOS 5D Mark III and EOS 6D remain popular cameras for many serious enthusiasts and pros shootings weddings, events, or press stories. 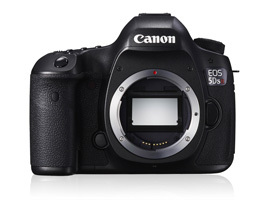 If it’s studio or landscape photography, the 5DS R’s huge resolution will appeal, however, and with marginally better scores in all sub-categories, the 5DS R offers around one-half stop better color and dynamic range over the EOS 6D and 5D Mark III. The same is true when comparing the Portrait and Landscape results from the 5DS R to the lower-resolution 18.1Mp EOS 1Dx. The 1Dx is Canon’s flagship high-performance DSLR, which offers better low-light ISO DxOMark sensor scores as well as better performance, with a fast continuous frame rate and excellent autofocus capabilities for the professional sport, press, or wildlife photographer. If it’s a super-resolution studio camera for the best picture quality or large-scale prints you’re after, however, how does the 50.6Mp 5DS R stack up against the high-resolution offerings from Sony and Nikon? 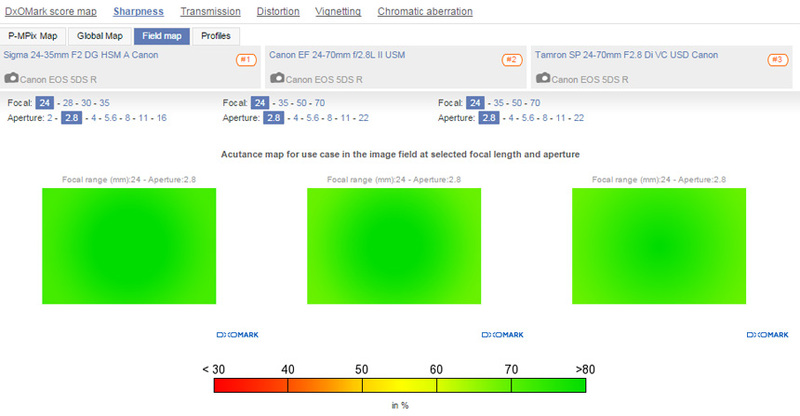 Well, despite its superior resolution in terms of pure DxOMark sensor scores, the EOS 5DS R has yet to crash through the 90-point barrier and offer a significant challenge to the best-performing sensors on our database. With an overall score of 97 points, Nikon’s 36Mp D810 offers around a two-thirds’ stop advantage over Canon’s 5DS R. The Nikon D810 really excels for dynamic range, where its score of 14.8EV is the highest we’ve recorded and is almost 2.5 stops better than the 12.4EV recorded on the EOS 5DS R. Landscape photographers take note! So at lower ISO sensitivities up to ISO 200, the Nikon D810 is far ahead for dynamic range, but results against the Canon sensors narrow as sensitivity is increased. 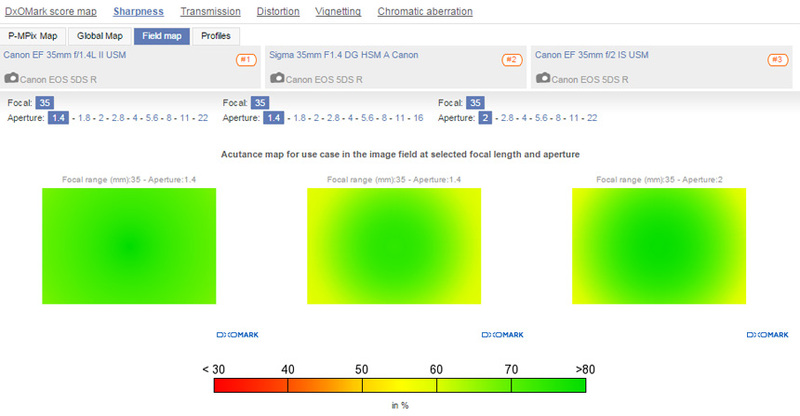 From ISO 800 on, therefore, the Nikon D810, EOS 5D Mark III and 5DS R offer comparable levels of dynamic range.